Every year our opening hours will be changed with the time shift. 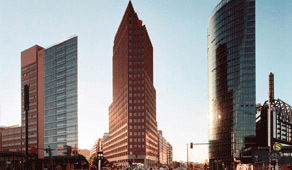 PANORAMAPUNKT is located on the 24th and 25th floors of the Kollhoff Tower on Potsdamer Platz, one of the most vibrant and important squares in the world. The main entrance is on Potsdamer Strasse in the opposite of the DB-Tower. The Kollhoff-Tower rises up where the Berlin Wall once stood. Today the old border is marked throughout the city with a double line of cobblestones.